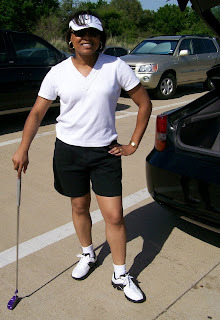 yep, that's me with a putter in my hand. it's almost funny because i typically have no coordination. but i'm not too bad at golf! and even after all the years at band camp/rehearsal, i still can't stand the sun to be in my eyes. This entry was posted on Saturday, May 17, 2008 and is filed under about me . You can follow any responses to this entry through the RSS 2.0 feed. You can leave a response, or trackback from your own site.